Do you buy Teacher / Instructor Edition books? Yes, we gladly accept Teacher / Instructor edition books. All books must meet our condition guidelines. Teacher's / Instructor's Edition books must be quoted with their own respective ISBN - whenever it is available. This can be found either on the back of the book or on the copyright page. An Instructor's Edition should be quoted with the Instructor's Edition ISBN and not the Student Edition ISBN. 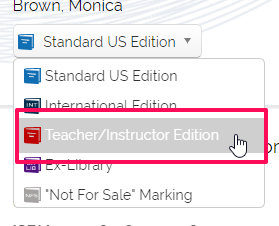 To quote one of these items, you must choose the "Teacher/Instructor Edition" option from the edition drop-down.